New 200 George Street café extends ‘profit for purpose’ catering services of YWCA NSW. Iconic women’s support charity, YWCA NSW has joined forces with Mirvac to open a unique café concept at Mirvac’s newly completed 200 George Street headquarters. 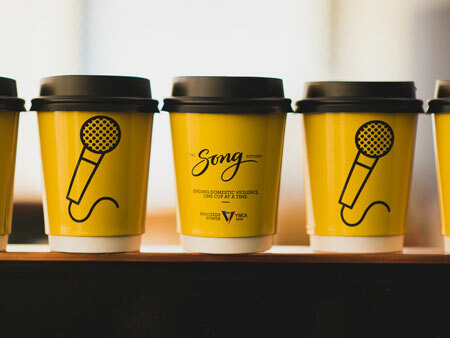 Known as the ‘The Song Kitchen’, the profit for purpose café is one of the first ventures of its kind in Australia. It will provide premium catering services to the Mirvac team and their guests, with 100 per cent of the profits going to fund YWCA NSW services for women and children experiencing domestic violence. YWCA NSW CEO Anna Bligh said, “YWCA NSW is undergoing a transition from a broad based organisation to an organisation that the voice of women – expanding domestic violence services ensuring women and children are safe, with the ultimate goal to put an end to domestic violence. As part of the restructure, we are committed to extending our innovative ‘profit for purpose’ operations beyond our two Sydney hotels and Mirvac have proved the ideal partner to work alongside us to achieve this goal. Mirvac’s CEO & Managing Director, Susan Lloyd-Hurwitz said, “At Mirvac we are committed to acting in a sustainable way and thinking creatively about how we invest in our communities to create social impact. Our new headquarters at 200 George Street provided an opportunity for the team to do things differently and make a real difference at the same time. “Excitingly The Song Kitchen will also meet the standards of the Gold WELL rating Mirvac is targeting as part of our tenancy. This means ensuring availability of healthy choices, transparency in labelling and utilising organic or sustainable ingredients wherever possible. “Mirvac is proud to pilot this exciting concept and we are confident the model will be quickly adopted by other Australian companies as a commercially viable way of incorporating a social enterprise into a complex supply chain. Since 1984, the YWCA NSW has pioneered the ‘profit for purpose’ fundraising model with its Y Hotel in Sydney. Throughout 2016 Y Hotel is undergoing extensive refurbishment. In November it will reopen its doors proudly rebranded as The Song Hotel, reflecting the empowerment and positivity associated with the international YWCA movement. The hotel will also be home to a sophisticated new licenced café that will open at the same time. Officially opened early this month, 200 George Street is a new world-class office environment for Sydney. Home to EY and Mirvac, among other high calibre brands, the building showcases industry-leading design, technology and sustainability features, as well as new look, activated ground plane.